CHECKOUT Shipping costs are displayed in the checkout pages. Ford Licensed Accessories is pleased to offer the Aeroskin hood deflector for CMAX vehicles. This aerodynamic alternative to traditional hood deflectors flush-mounts directly to the hood using 3M automotive grade tape. Installation is simple and quick; no drilling or hardware required. Available in a smoke acrylic finish. Most items will ship within 24-48 hours. Special order items take a longer lead time. Our buyers work diligently to provide us with the quantities we expect to sell. We will do everything possible to ship the products promptly. Shipping and handling charges are straightforward and simple. They are conspicuously displayed in the shopping cart. Certain items such as bed mats, running boards, cargo extenders and trailer hitches will require a slightly higher freight rate, this is also displayed in the shopping cart. Due to the exclusivity and limited availability of many of our items, Ford Motor Company may only provide some items while supplies last. If a product is ordered that has been discontinued by Ford Motor Company and is out of stock, you will be notified within 24 hours via e-mail. All items will be shipped Fedex Ground or UPS Ground, except APO/FPO orders, which are shipped USPS Parcel Post. Expedited shipping may be available at extra cost. Please contact us to verify availability and fees. .
LIMITED WARRANTY INFORMATION FOR GENUINE FORD, LINCOLN AND MERCURY ACCESSORIES, ALONG WITH FORD, LINCOLN AND MERCURY LICENSED ACCESSORIES. Genuine Ford Accessories, Genuine Lincoln Accessories and Genuine Mercury Accessories will be warranted for whichever provides the greatest benefit: 12 months or 12,000 miles (whichever occurs first), or the remainder of the Bumper-to-Bumper 3-year/36,000-mile New Vehicle Limited Warranty. Contact your Ford Dealer for details and a copy of the limited warranty. Ford Licensed Accessories (FLA), Genuine Lincoln Accessories (LLA) and Mercury Licensed Accessories (MLA) are warranted by the accessory manufacturer’s warranty. FLA, LLA and MLA are fully designed and developed by the accessory manufacturer and have not been designed or tested to Ford Motor Company engineering requirements. See your Ford Dealer for details regarding the manufacturer’s limited warranty and/or a copy of the FLA or MLA product limited warranties offered by the accessory manufacturer. 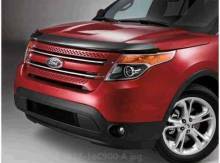 Cover Genuine Ford Explorer Accessories In A Ford ESP Premium Care Plan. Depending on the Ford ESP Plan you select, some dealer-installed Genuine Ford Explorer Accessories can be covered for up to 7 years or 100,000 miles. Details at your dealership. Fully capable to handle whatever you throw at it, the Ford Explorer is 100% SUV. Always has been. Always will be. It also leads the way with an available 2.0L EcoBoost® I-4 engine that delivers best-in-class hwy fuel economy. That turbocharged EcoBoost propulsion is taken to a 3.5L V6 level in the new Explorer Sport: It also treats you to paddle shifters, a sport suspension, black exterior accents (from 20" wheels to the front grille), unique interior appliqués, an Audio System from Sony, and leather-trimmed seats in Charcoal Black or Charcoal Black with Sienna inserts. The Ford Explorer, the flagship model that popularized the SUV segment of the automotive industry with its award winning design and functionality. 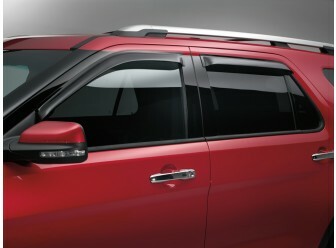 The stylish Ford Explorer really shines brighter when equipped with genuine Ford accessories. 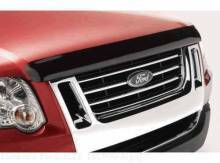 We find that many new Ford Explorer owners are quick to install a low profile or wrap around bug shield, side window deflectors, splash guards and Ford floor mats that enhance their Explorer even more. We see others who go even further and purchase cargo organizers, bike racks and trailer hitches. The Ford Explorer is a true sport utility vehicle that still excites the senses. As a franchised Ford dealer, Lombard Ford is authorized by the Ford Motor Company to sell Ford parts and accessories. Fill out the following form and we´ll let you know if a new product is released for your exact year/make/model vehicle. Copyright © 2019 . Images of products supplied by Ford Motor Company.